The National Association of Insurance Commissioners (NAIC) released its latest annual report on auto insurance costs and expenditures on Monday, and, based on the report’s 2010 data, Louisiana is still the state with the priciest premiums for a policy with liability, comprehensive and collision coverage. The average price for such a policy in Louisiana was $1,295, making it the costliest state the third year in a row. Louisiana’s average premium was 1.8 percent more than in 2009, when the average cost was $1,271. In states like Michigan, for instance, a large part of a policyholder’s premium goes to pay for state-mandated personal injury protection coverage. But that type of coverage is excluded from the policy used for the comparison, since it only includes liability, comprehensive and collision coverage. Even though Michigan is commonly referred to as one of the costliest states for auto insurance, it only entered the top 10 of the NAIC’s list this year, seeing a 2.9 percent increase in average combined premiums. Auto coverage got more expensive overall in the U.S., with only 15 states seeing their combined average premium fall between 2009 and 2010. The biggest jump was the 4.8 percent year-over-year increase in New Jersey, rising from an average policy cost of almost $1,218 to $1,276. Other major hikes to average combined premiums occurred in Wisconsin, where costs rose 4.5 percent between 2009 and 2010, and Iowa. Although Iowa was the state with the cheapest insurance in the NAIC’s rankings both this and last year, it still saw a 3.9 percent rise in costs between those years. 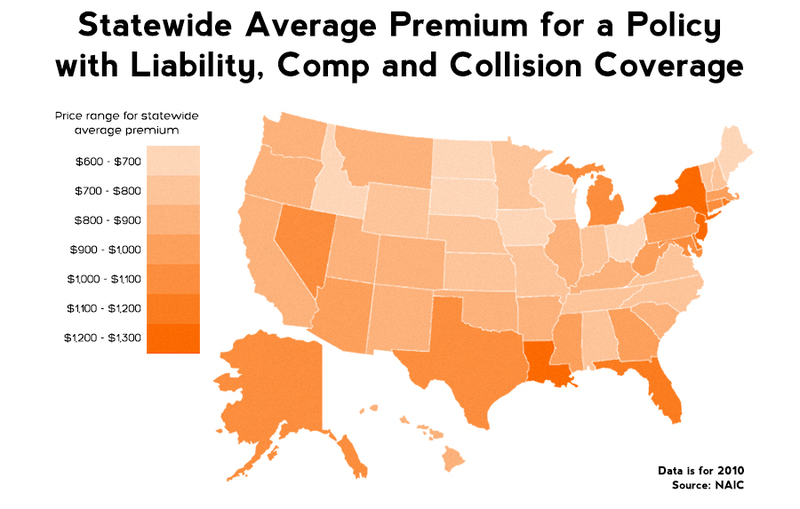 Nationwide, the average premium for a policy with liability, comprehensive and collision coverage rose to $907 in 2010, a 0.6 percent uptick from the year before. The 2010 average premium is down 3.2 percent from 2006, when it was $937.